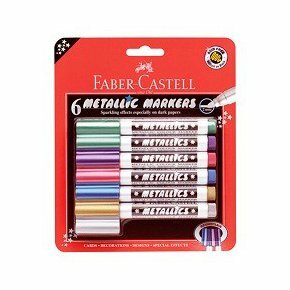 Metallic colouring markers for sparkling effects on light and dark papers. Non toxic water-based colours, washable from most clothing. Unique childsafe ventilated Connector cap allows passage of air if accidentally swallowed. Clip markers together neat and tidy or create clever designs. Special ‘Click Seal’ helps prevent drying.